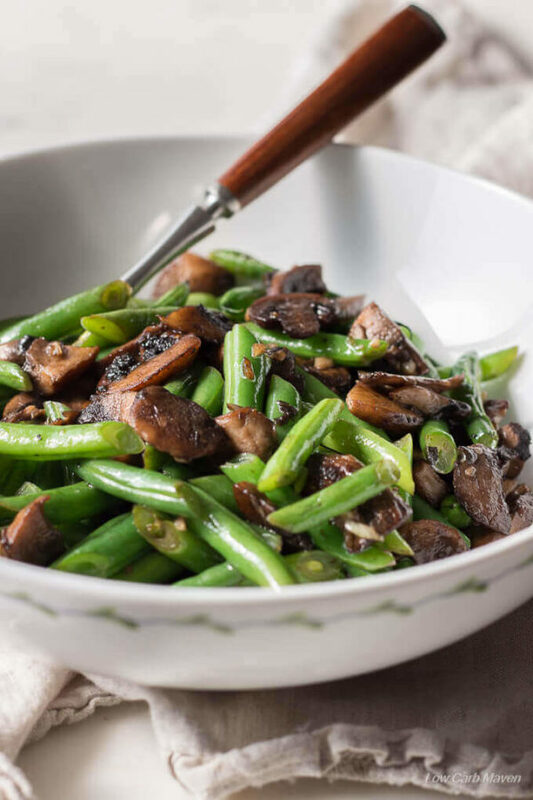 This healthy Green Bean Mushroom Saute is the perfect low carb vegetable side for any low carb or keto diet. It takes minutes to make is tastes great. This easy low carb green bean mushroom saute takes literally minutes to put together. The beans are crunchy and the mushrooms soak up loads of flavor. I’m often asked which vegetables are best for a low carb diet. The answer is green leafy vegetables, non-starchy vegetables, and those that aren’t naturally sweet. Green beans and mushrooms are two of my favorites. Green beans can be fixed many ways in casseroles, sauteed, roasted, or cooked in broth. Mushrooms can be stuffed, roasted or sauteed. 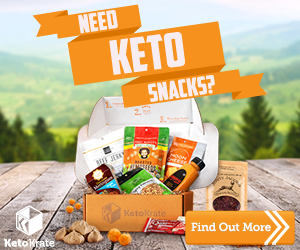 Read my low carb food list for a list of the best low carb vegetables to have on a low carb or keto diet. 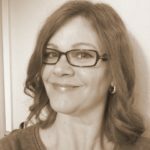 I just finished up a Back to Basics Challenge on the Low Carb Maven Facebook page. It was a lot of fun. 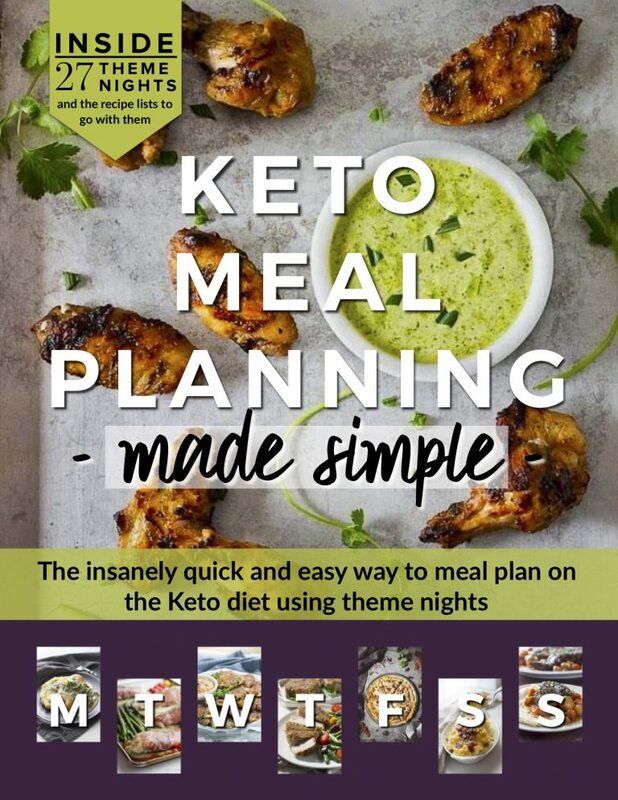 I shared most of my menus for the two weeks as well as the nutritional information for each day and breakdown of macros (percentage of fats, proteins and carbs). Many people thought they were helpful. Here’s the link for the first week of the challenge and here is the link for the second week of the challenge. I like to interact with Facebook followers and ask them questions. 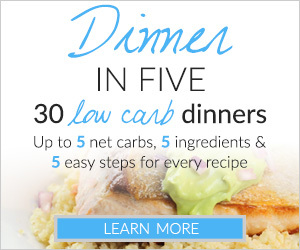 One thing I see mentioned repeatedly are requests for help with low carb sides. While generally people have no problem with the protein component of a low carb diet, many struggle with sides – especially variety. I know I did! 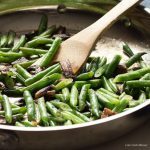 Low carb sides can be as simple as steamed vegetables with butter or a little more elaborate like a low carb green bean casserole. 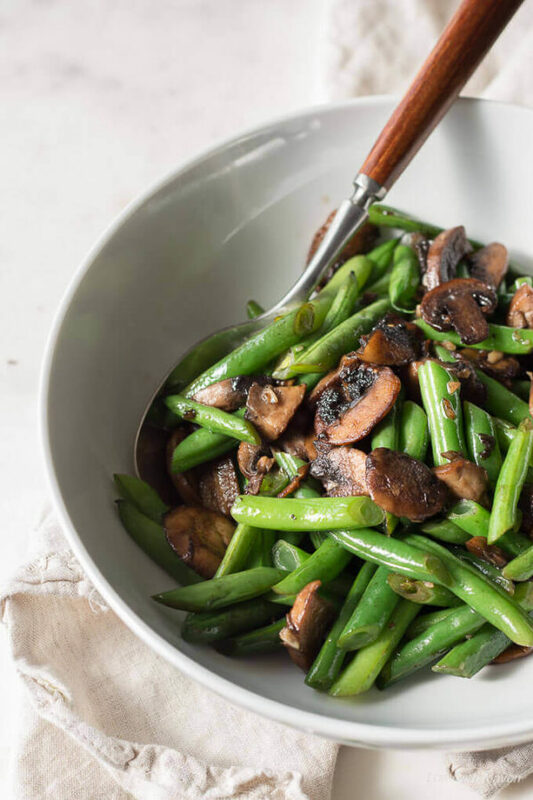 This green bean mushroom saute falls into that easy low carb side category – and it’s great! I really like this healthy green bean mushroom saute because it requires minimal effort and it’s ready in about 5 minutes. It tastes great on it’s own but, is ready for any of your favorite flavor additions. Try Siracha, spices, dried or fresh herbs or adding grape tomatoes. For quick low carb vegetable side ideas check out this post that talks about 10 Ways To Vary Your Vegetables. 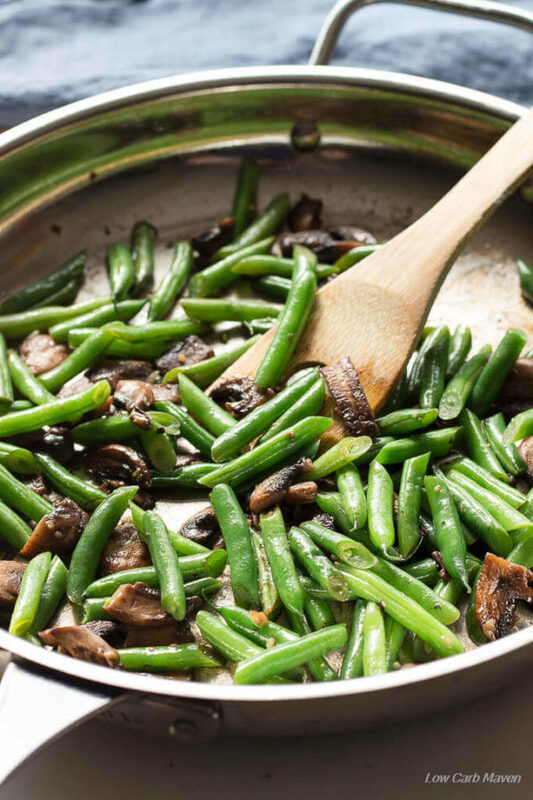 This healthy green bean mushroom saute is 4 net carbs per serving. Cut green beans to your desired length. Mince Garlic. Heat a saute pan or skillet over medium heat. When hot, add 1 tablespoon olive oil and 1 tablespoon of butter and swirl to coat. When the butter just begins to brown, add the mushrooms and stir to coat. Let them cook for 1 1/2 minutes, then stir. Add the green beans to the pan and 1 tablespoon of water. Cover and cook 2 minutes. Uncover and stir. Add the garlic on top of the vegetables and add the remaining tablespoon of water. Cover and cook for 1-2 minutes more or until the beans are cooked to your liking. Uncover the vegetables, stir, and cook for another minute more. Add red wine vinegar and season with salt and pepper to taste. Serve. Makes 3 generous portions or 4 smaller portions. I’m doing this tomorrow. Doubling it and serving over rice as an entree with naan. Might toss in a little crumbled bacon. Luckily I cook for three adults who like this sort of thing. Thanks for the inspiration. Has anyone tried this with frozen green beans? I have a stash in my freezer I’m hoping to use up. Delicious! I just did green beans, no mushrooms (hubby doesn’t like them) but followed the directions otherwise. The beans were amazing with the Parmesan crusted pork chops! What a delicious and healthy side dish! Mushrooms go perfectly with green beans! I think side dishes are always the unsung heroes of a meal. This combination looks really tasty. I like the idea of using some vinegar in it. I absolutely love crunchy green beans, but do not love mushrooms. My husband loves mushrooms but detests crunchy green beans. This would be the perfect dish for us to eat together! Lol! :) It looks delicious! This is a fantastic side dish. I love green bean and mushrooms, so these combined with garlic and the other ingredients must be tasty! I might just sprinkle some bacon crumbles on top of this too. How did the Induction challenge go? I like to do one periodically, especially after the holidays if I go off track too much. I was so sick over the last holidays that I did not get to overindulge. The only good thing about being ill (you lose weight). This looks so easy! And a perfect combination!